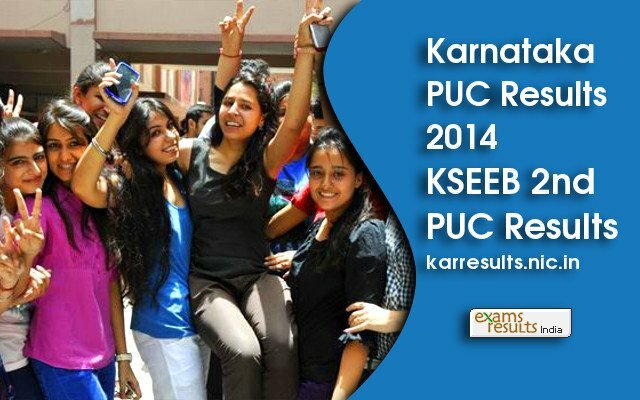 KSEEB 12th Class Results or Karnataka 2nd PUC Results 2014 is declared by Karnataka Pre University Education Department on First Week (9th May 2014) of May 2014. Students who appeared for 12th Class Examination can get their results after the official announcement. The results are available on the official website Karnataka PUC Dept and Karnataka NIC Result Website. Karnataka IInd PUC Exam was held from 12th March 2014 to 27th March 2014. More than 6 Lakh students appeared for Karnataka PUC Exam 2014. There were 2, 05,502 students appeared for commerce stream, 1, 73,829 candidates appeared for the science stream and 2, 41,539 candidates appeared for arts stream. Every year Karnataka Dept of PUE is conducting these exams. It has been reported that in 2014 more than 63,000 teachers of the high schools were appointed for the evaluation of answer sheet of these 6 lakhs students. If any student failed to pass this examination then there is a second chance. The failed students can appear for the supplementary or the compartment exam which will be organized by the Karnataka PUE board in the month of June or July. The Dates for Supplementary Examination will announce after the declaration of IInd PUC Results 2014. Candidates must apply for the supplementary examiantion at the earliest with the application fee. Supplementary Examination Application Fee and the Dates are available after the Results. After that you have to click on the link Karnataka PUC 2nd Exam Result 2014 in website home page. Now enter your roll number and click on the Submit button. Now you result on you screen. You can take printout of your result. Karnataka Pre-University Department is in charge of Higher Secondary Education in Karnataka. The Board is conducting Higher Secondary courses in the state and Conduction PUC Examinations in the state every year. The Karnataka PUC Results are also declared by PUE Board. The Board is functioning under the Department of Primary & Secondary Education Karnataka. There are 1202 Government Pre-University colleges, 637 Aided Pre-University colleges, 1936 Unaided Pre-University colleges, 165 bifurcated Pre-University colleges & 13 Corporation Pre-university colleges under Karnataka PUE Board. After X standard every year about 10 lakhs students enroll in the two year Pre-university courses. The courses offered by the Department are broadly classified under the categories of Humanities (Arts), Science & Commerce. There are 23 subjects, 11 languages and 50 combinations in the Pre-University curriculum. In 2010-11, there were 4,43,185 students in Humanities in I & II PUC, 2,47,421 students in Science in I & II PUC & 2,77,189 students in commerce in I & II PUC.